The safety and innocence of summer begins to fade. The days grow short and cold as the shadows creep ever closer, bringing with them untold terrors that drive mortals to the edge of madness. The Ancient Ones are stirring. The time for Arkham Nights 2018 has come! On October 19 – 20 at the Fantasy Flight Games Center in Roseville, Minnesota, Fantasy Flight Games will once more host our annual two-day celebration of Lovecraftian horror and gaming! Whether you’re looking for a place to recover your sanity or you’re hoping to investigate the things that lurk where light can’t reach, there’s no better place to celebrate the influence of H.P. Lovecraft’s mythos on our favorite games! As a grim locale for celebrating your favorite Lovecraftian board games, there’s nowhere better than Arkham Nights. 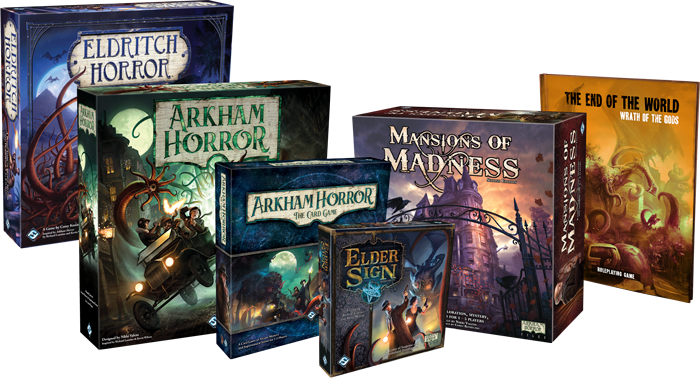 Here, you’ll be able to celebrate both new and classic Arkham Horror Files games and connect with the community. You may test yourself with the second part of a two-part scenario for Arkham Horror: The Card Game, The Night's Usurper. Or, you may seize the chance to play Arkham Horror with original designer Richard Launius on a custom, massive board. You’ll gain access to forbidden knowledge as designers Nate French and Matt Newman give you exclusive insight into the design process for Arkham Horror: The Card Game with a Card Council, where several lucky raffle winners will help create a unique card for the game. All attendees will receive a copy of the designed card before the end of the event on October 20. Throughout the event, members of the Fantasy Flight Games development team will be offering "Play with the Designer" opportunities—beckoning you to a play experience unlike anything you’ve seen before. At Arkham Nights 2018, you can celebrate Lovecraftian horror in all its forms, as the event will feature both classic games and new adventures. Here, you’ll have the chance to experience demos and playthroughs of Eldritch Horror, Elder Sign, Mansions of Madness, Arkham Horror: The Card Game, End of the World: Wrath of the Gods, and even to look beyond the veil with previews of the highly anticipated Arkham Horror Third Edition! If you should brave the darkness, you will receive a gift bag only available to those who attend the event. You'll gain an exclusive 6” by 9” black velveteen bag emblazoned with an eldritch emblem, as well as a collection of acrylic health and sanity tokens, a set of Arkham-themed dice, a preview character from Arkham Horror Third Edition and one from Elder Sign, a deck box, and a copy of The Night’s Usurper scenario for Arkham Horror: The Card Game before its wide release. These mementos may be all you have to prove that you witnessed this horrifying event—be sure to keep them safe. Mark your calendar for October 19 – 20, and purchase your tickets here! Arkham Nights 2018 is held in the Fantasy Flight Games Center, located minutes from downtown Minneapolis and right off of I-35W. Watch this space for more content related to Arkham Nights 2018, such as the schedule!